PUNE: Renowned wildlife conservationist Maruti Chitampalli will be presented the lifetime achievement award at the 12th edition of the Kirloskar Vasundhara International Film Festival, which will be held at Balgandharva Rangmandir and Ghole Road Art Gallery from January 4 to 8. Addressing a news conference on Wednesday, festival director Virendra Chitrav said, "Chitampalli has been instrumental in the development of Karnala Bird Sanctuary, Navegaon National Park, Nagzira Sanctuary and Melghat Tiger Project. 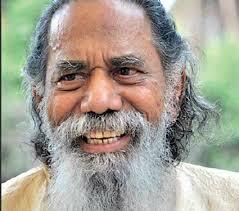 He is also a Marathi writer and had presided over Marathi Sahitya Sammelan in Solapur in 2006." The festival this year is planned around 'Prevent pollution, protect rivers'. Around 155 films on the theme from over 28 countries will be screened over four days. "The festival which starts in Pune is taken to almost 22 cities around the country. These movies are relevant to everyone as the problem of river pollution is plaguing everybody's life," Chitrav said. Eco Bazar, which has been a major attraction during the festival, will be inaugurated on January 5. Apart from film screenings, several other activities like photography exhibition have been planned for the patrons. Of the 2,600 entries received for the photography competition, the best 120 will be displayed during the festival that will be inaugurated on January 5. "A special pavilion will be set up for displaying the photographs taken by Pune's press photographers," Chitrav added. Jeevitnadi, a city-based organisation that works for the rejuvenation of rivers, will conduct river walks and river action for the participants. "In river walks, we will tell the story of the river which includes its history and life over the years. This project helps us in raising awareness about the river. Under the river action activity, we request people to adopt a stretch and work towards its rejuvenation," Shailaja Deshpande, director of Jeevitnadi, said. There are around 55 organisations and 50 colleges associated with this year's festival. Several activities have been planned for the schools and colleges that are associated with the festival and include Eco Quiz, Street play competition.